Book an April Day Trip Today! Christina, newest member of the Quality Chicks, does not take lunch breaks. Not when 25" rainbows cruise by the picnic table. 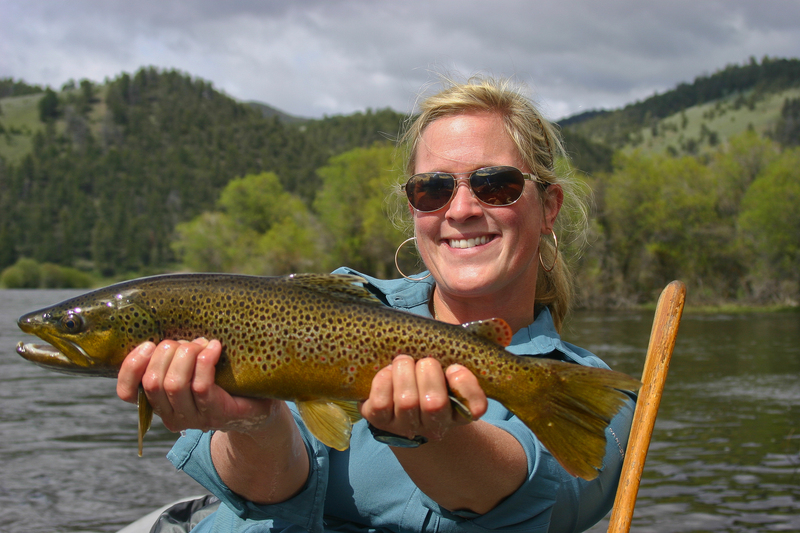 Christina showed up at the Big Hole Lodge, just her second trip fly fishing, ready to begin her journey toward mastering the sport. Her bags weren't even unpacked before she strung up a rod and began casting practice with fellow Chick, Chris, on the front lawn of the lodge. Over the course of the week, she caught numerous fish and even completed the Big Hole River Grand Slam, catching a grayling, cutthroat, rainbow, brookie, and brown all in one day. 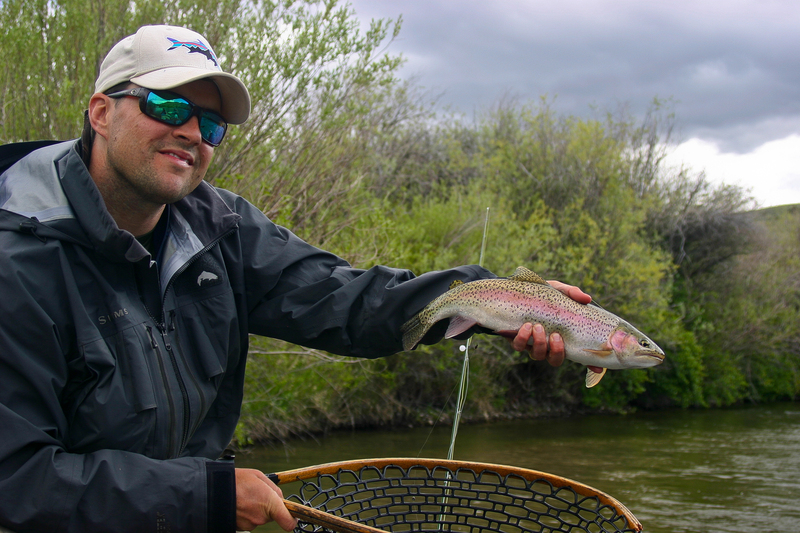 On her final day of the week, guide Marc took her and three other Chicks down to the Beaverhead River. After a productive morning, the crew spread out table clothes under a sun tent on Wheat's Pond and sat down to a liesurley lunch. Or so they thought. Two bites into her sandwich, Christina spotted a massive rainbow cruising the shore near the tent. She grabbed her rod and carefully flipped a crawfish pattern into the moss in front of the fish. She waited until the big bow swam within sight of her fly and she twitched it ever so slightly, just enough to give it the illusion of a live crawfish burying itself in the moss. BAM. The rainbow flipped its tail and dove on the fly. As soon as it felt the hook it was running across the lake like a bonefish, peeling line off of Christina's reel, and taking her well into her backing. And then it ran back, sending Christina back-peddaling to the barbed-wire fence surrounding the lake. Her line caught in the fence briefly, then wrapped around her legs just as the fish turned for another run. Marc saw what was bound to ensue and leapt from his lunch. He ran to Christina, stuck out his arm, and shouted, "Grab my arm and lift your legs!" As Christina did a one armed pull-up on Marc's arm, fellow guide, Mike, untangled the line from her feet. All the while, the three were shuffling toward the shore as the rainbow tugged them from the other side of the line. At this point it was unclear who had caught whom. In the end, Christina was admiring her conquered through the lens of her underwater camera as Marc revived the fish near shore. Congratulations on a great week! I'm sure he spotted me long before I spotted him, but he was nice enough to pose for a drive-by on the way to the Beaverhead yesterday. 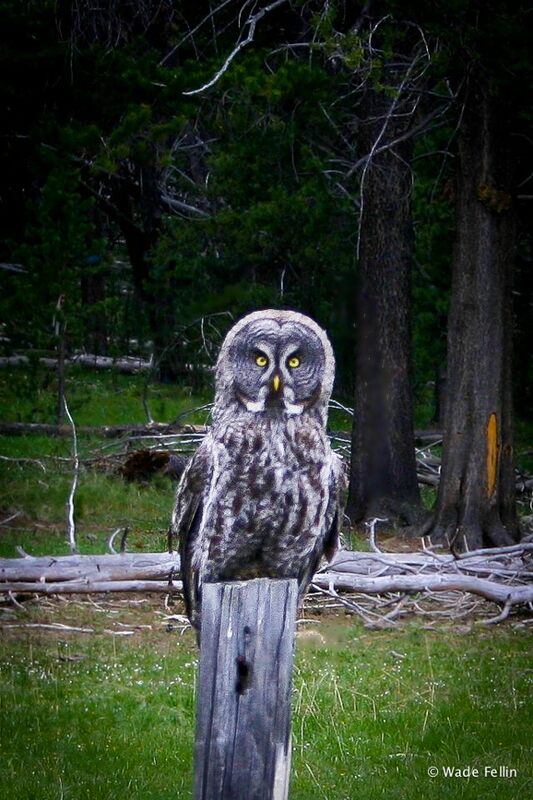 Apparently, this gigantic Grey Owl has been hanging out near Crystal Park for years and is quite friendly. Last Fall, a few brave souls ventured to Central America in search of wily Permit and feisty bones on the pristine flats of the Turneffe Atoll, at Turneffe Flats Lodge. It was there my father and I met Lonnie Allen and her entourage of gung-ho fly-fishers. Among them was a striking young couple out of coastal Texas, named Monte & Allison, or "Mollison" as they were known at A&M, and to those following their MyFace account. In Belize, Monte was one of just two anglers, amidst the bullpen of experienced fly-casters, able to hook and land a permit in the post Hurricane-Richard conditions. This Spring, (I realize it is late June, but for all intensive purposes it is still very much Spring in Montana) I had the pleasure of guiding Monte & Allison while they visited their Stevensville, MT home. The river had been rising for the better part of last week and the weatherman was preaching gloom and doom, but these adventurous anglers showed no fear. In the face of high water, stormy skies, and probable defeat, Allison-"Duck while I hit this fish"- & Monte-"Spank the Bank"- Richardson, arrived rigged with heavy streamers and ugly nymphs, ready to hunt. The Big Hole was running 8,000 cfs and water temps were plummeting to the mid 40's when we dropped the boat in on Saturday. In an attempt to recreate my luck from late May, we let the beer flow like wine in hopes that the fish would instinctively flock like the women of capistrano. 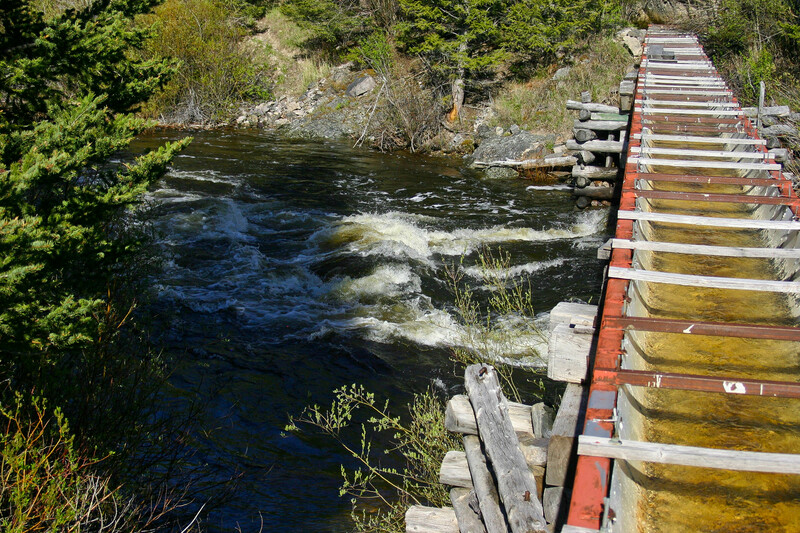 Using flies Lee Wulf never heard of, like a streamer aptly dubbed, "The Blue-eyed Mattress Shaker" or the "Yellow Bellied Dung Warbler", we slammed the banks with wet-flies and stripped streamers through the tannic waters of the upper Big Hole. However, when these methods left us short of our big fish goals, we pulled over and waited for warmer weather. Aha! Finally, Monte spotted a rise and the start of a blue-winged olive hatch! We cut our 2x tippet and built a leader to 5x, to which we attached a sized #18 blue-winged olive. Monte worked a pod of arctic grayling while Allison and I feasted on a pulled pork sandwich...or was it chicken? In either case, it was delicious. 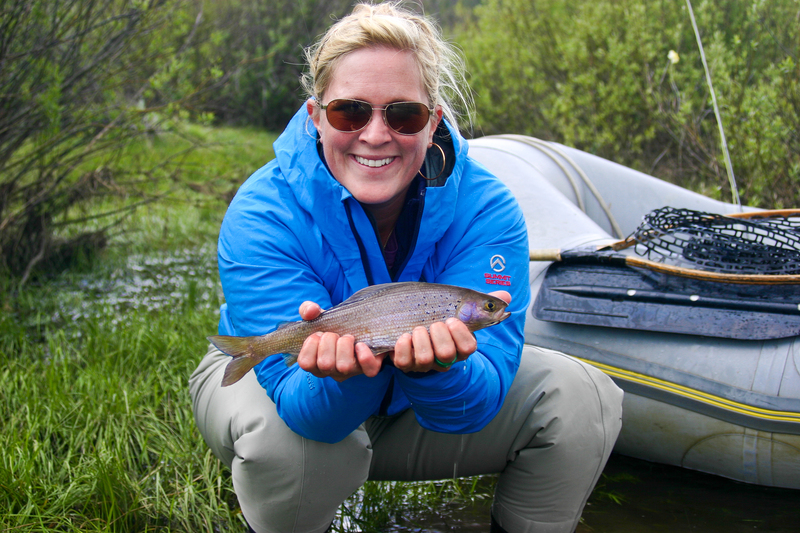 Soon after, Allison landed herself a grayling...decidedly more spectacular than that of her husband. As the river rolled down the valley, it picked up in speed and volume and darkened in color. We picked up a handful of grayling and brookies, but most of the afternoon was filled with stories of past fishing trips and laughter. We arrived at dinner with smiles on our faces and high hopes for the following day. The next morning, Father's Day, the water had dropped and warmed and the probability of the start of the Salmon Fly hatch had greatly increased. Unfortunately, the weather did not cooperate and the fishing was terrible through the morning. Allison was not about to let her husband miss out on a father's day celebration...after all, without her he'd never have been crowned a father. As I rowed through a bend in the river, she lowered her eyebrows and fired two stone fly nymphs under a massive willow, partly submerged on the bank. I hung my head and moaned as the line went taught, I had just tied that rig on. But wait! The line came straight at the boat, cutting through the heavy current. 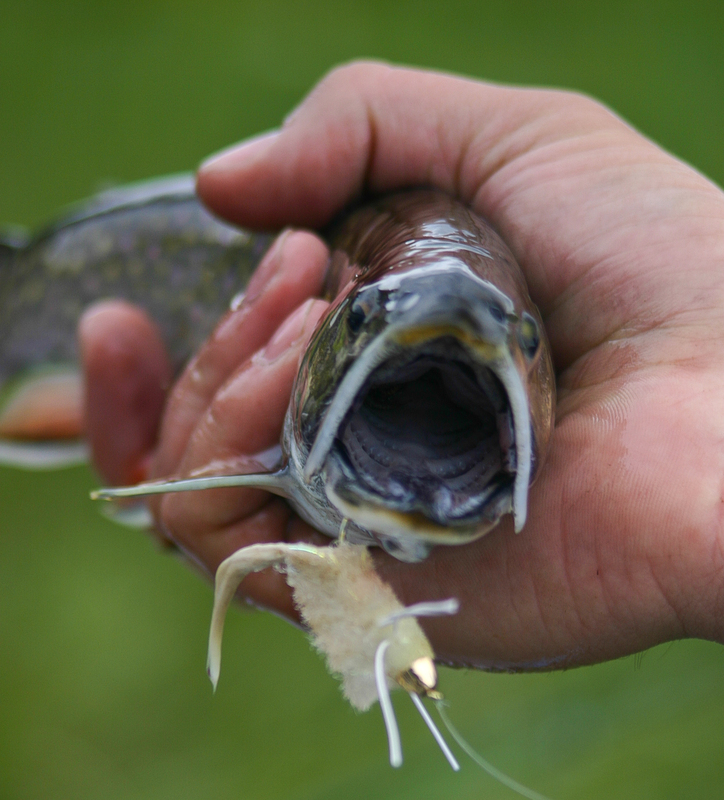 I laid on the oars and spun off of the furious brown trout who'd just been fooled by an excellent presentation. Fifteen minutes later, Allison was wielding a 21" brown and Monte's father's day was made. Unfortunately, that was the only fish we touched on the Big Hole that day. After the beautiful brown right out of the gate, the rest of the morning was extremely unproductive. We pushed down the river, pulled the boat out, and headed to the Beaverhead for an afternoon/evening float, well behind the massive holiday crowd. 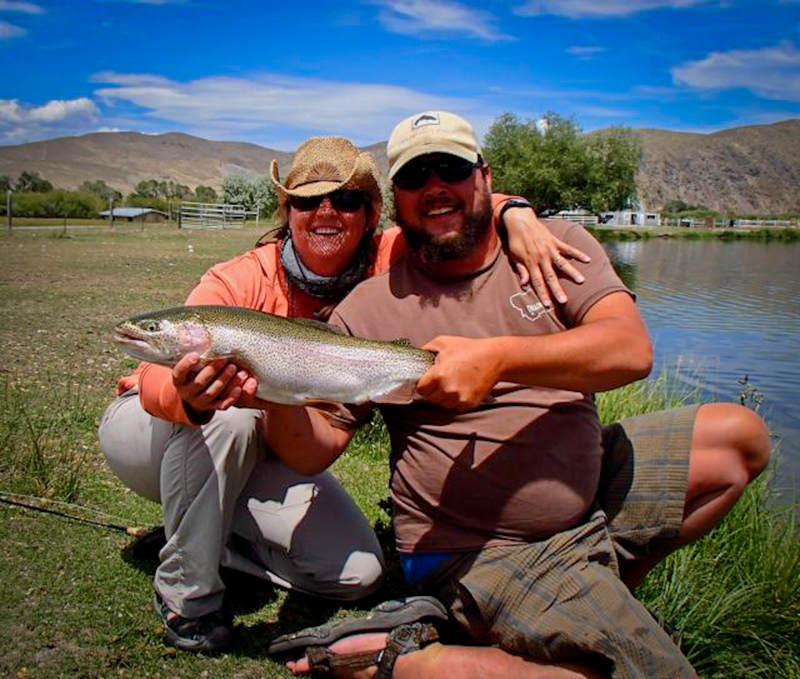 Allison immediately tagged a nice rainbow, followed soon after by Monte's acrobatic rainbow. 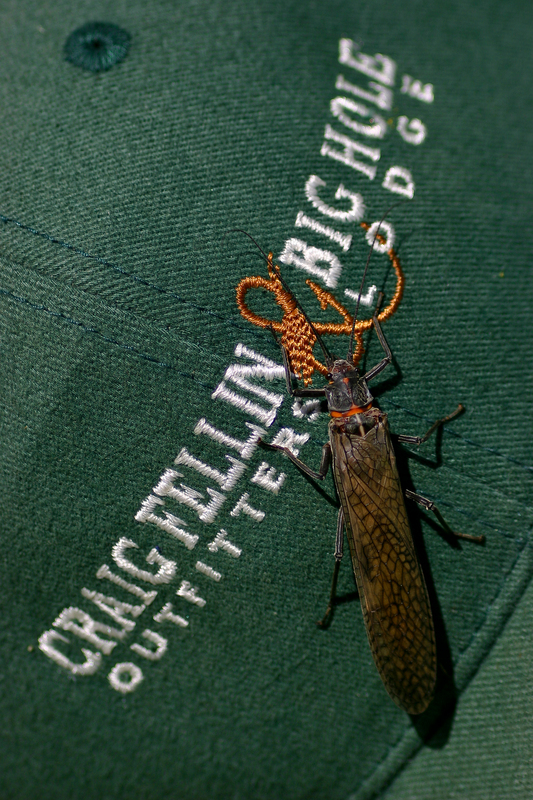 The sun came out, a caddis hatch came off, and our spirits quickly rose. 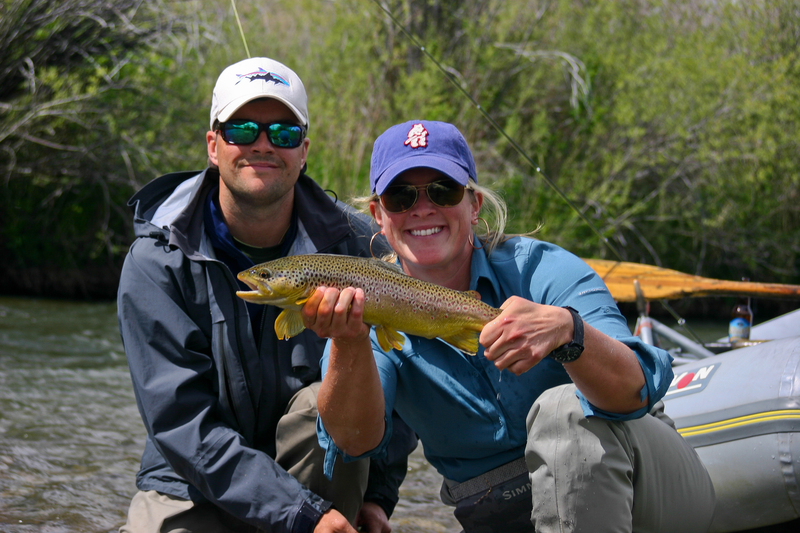 The Beaverhead is clear and in great shape above Grasshopper Creek, and as Allison proved to us, the brown trout population is in excellent health. We were sad to see the trip come to an end, (I started in with the sappy sentiment a good half a mile too early, when I failed to identify a bend in the river correctly, and for the first time in my guiding career I was appropriately dubbed a 'tool'!) 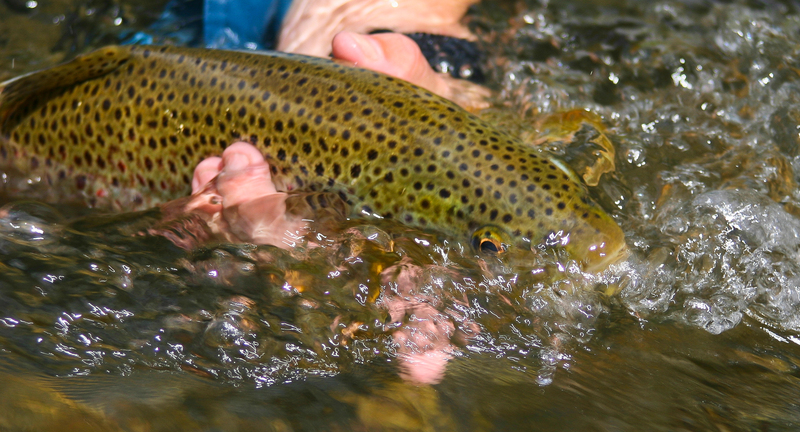 but we have a plan in the works to get into the guaranteed spectacular dry-fly fishing later this summer. 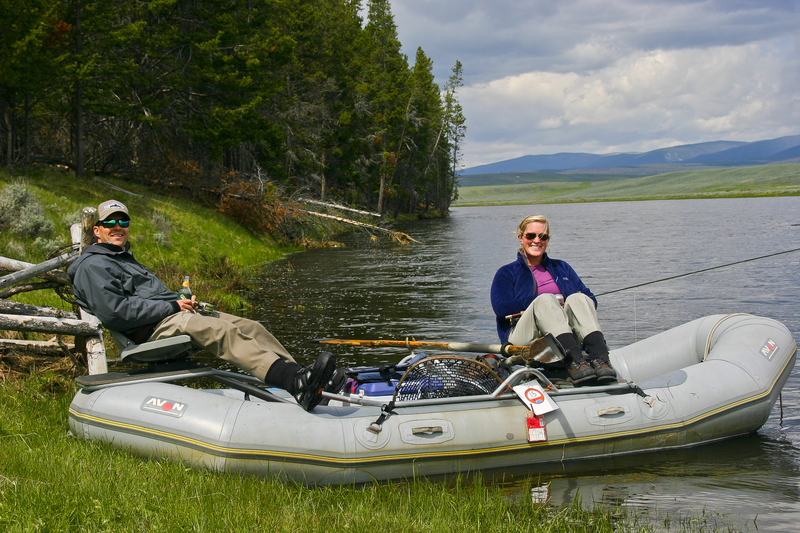 Allison & Monte have decided to take their talents to West-Central Montana, where they will be fishing the Mighty Mo with the Grizzly Hackle crew for the next week. We hope to read about their future exploits on their blog. Best of luck, thanks for the laughs, and I look forward to fishing with you again soon! Our season at Big Hole Lodge begins Thursday, and as you may have heard in the news we have a lot of water. The Big Hole has been running high all week, and has been fishing marginally on big nymphs and streamers. Last Saturday the river was out of it's banks in many places and the water was off color. The weather forecast for the rest of the week calls for slight chances of rain, cool day temps, and cold night temps. We expect the Big Hole to drop and clear over the next few days. 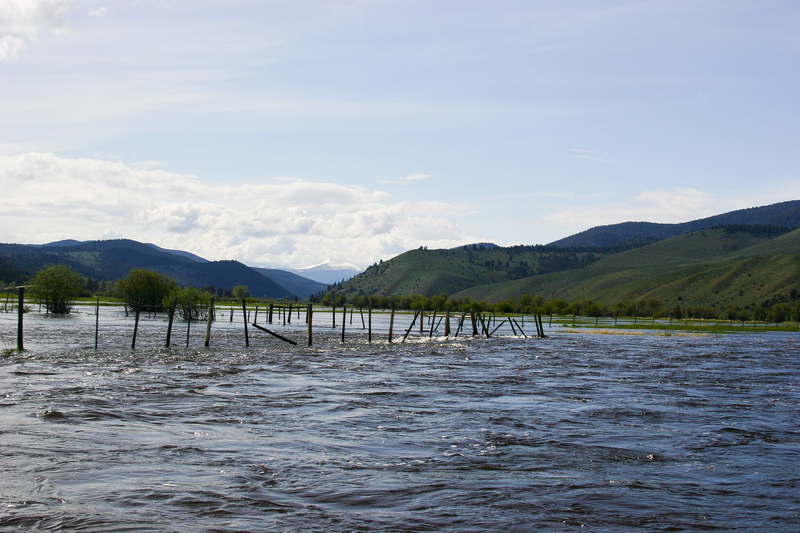 If this happens, the fabled salmon fly hatch will come off this weekend, or early next week. This largest member of the stone fly family lives as a nymph for three years before crawling to the banks and into the willows to hatch. 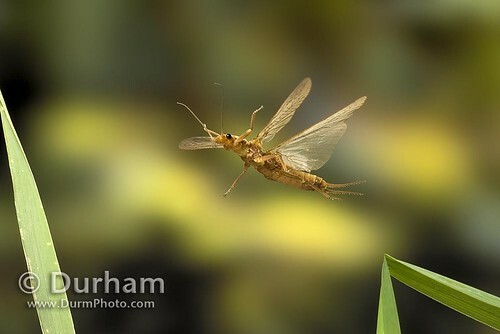 In its adult form, the salmon fly resembles the Red Baron's plane as it flies around the river with its dual wing system, and it is quite a meal for these hungry trout. The drought years of the 2000's all but killed the stone fly hatches. However, the Big Hole has enjoyed three years of healthy water flows and this years crop of bugs ought to resemble the standard of the 80's and 90's. 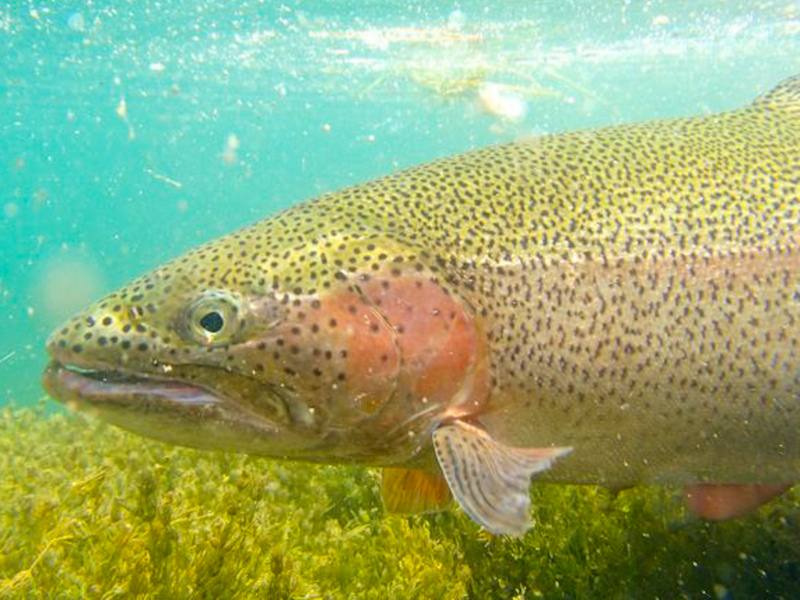 The fish are healthy and hungry so we all need to hope for cool temperatures and clear water. 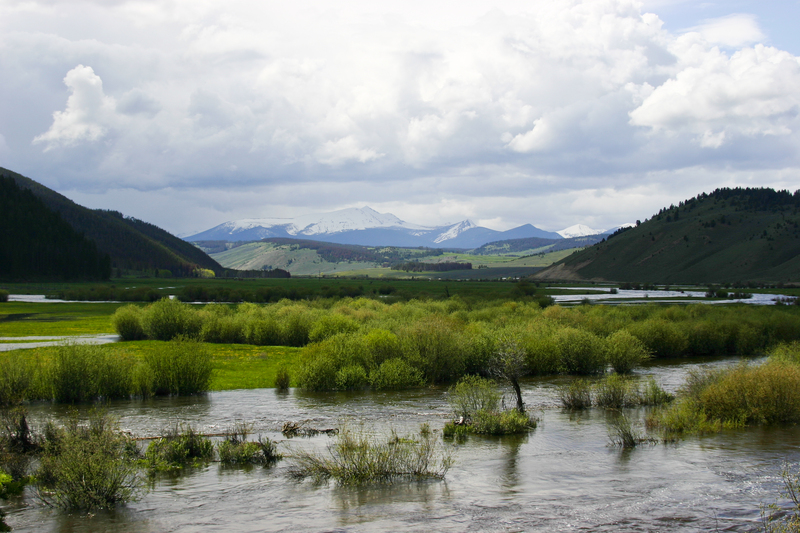 The Beaverhead also suffered through the drought years, especially in the winters when flows out of the dam were cut back substantially. 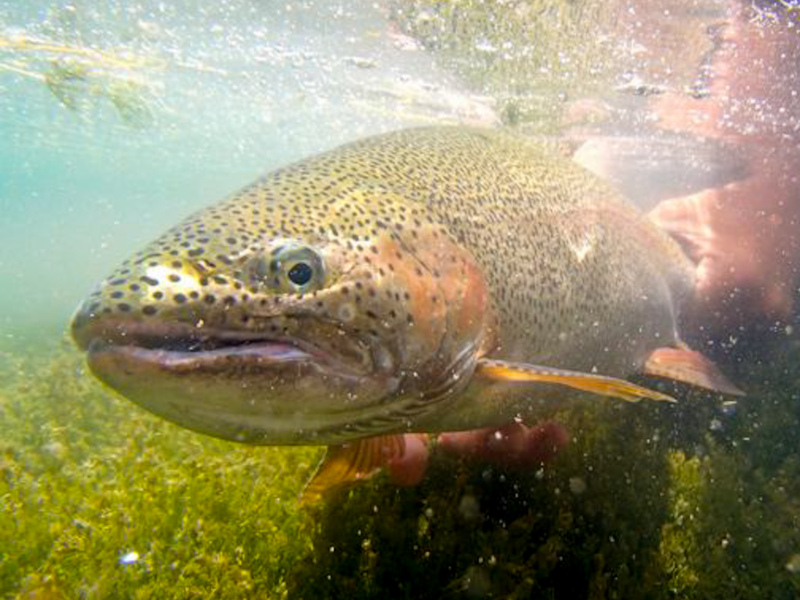 For the past three years, the powers that be have maintained a healthy flow of 200cfs throughout the winter and the fish have shown a lot of improvement. Currently, the river is running at a mandated 240 cfs even though the reservoir is approaching capacity. This is because the Missouri is nearing critical flood level and the Corps of Engineers has asked that the Beaverhead be cut back. This is great news for early summer fishing. 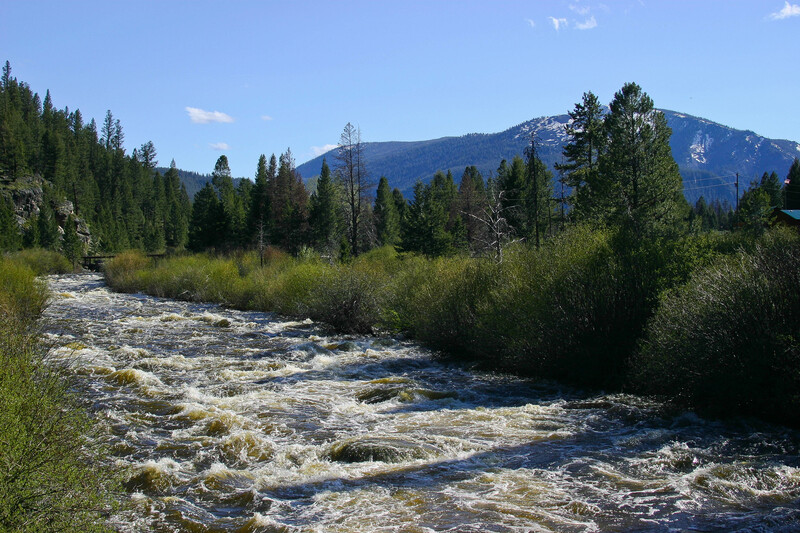 240 cfs is a late July flow, and though the Grasshopper Cr. is dumping in a lot of water and mud, dirtying the river and ruining the fishing, the upper river is in great shape and has been fishing very well. My father, a long time BHL guide Allen, and I threw the boat in for a few hours on a quick scouting trip to see what the river looked like before we start on Thursday. Unfortunately, for the first time this week there was not a cloud in the sky and the fish were not looking up. We did however, catch fish on nymphs when streamers did not produce. We boated eight fish in our quick 4 hour float, but I am eager to get back out to work the pools we passed up. The reports from Dillon indicate that the big browns of the 90's are back and the flows will be kept at this level until the runoff is over. The Wise is currently a kayaker's paradise....(In fact, when I took these pictures today a kayaker was on his way to the river to throw his boat in) It is running very high and fast and dumping a lot of water into the Big Hole. 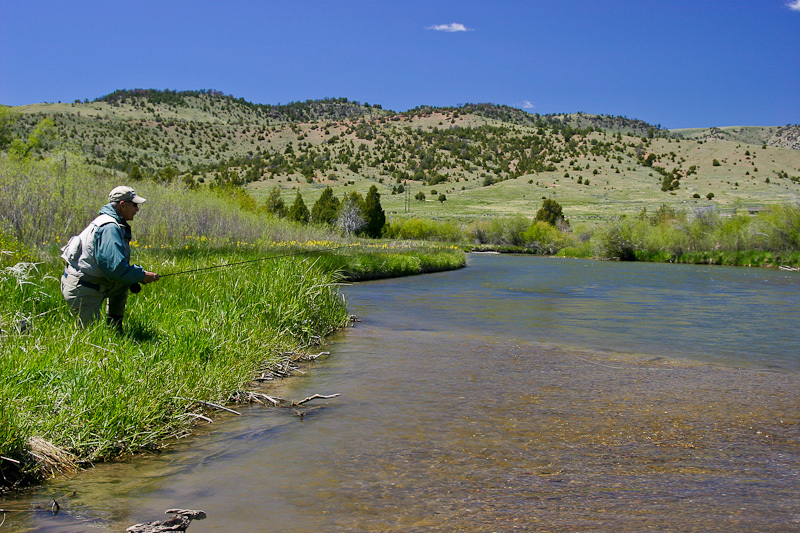 Fishing on the BH is much better above the confluence with the Wise than it is below. The bottom line is, Montana finally had the snow year it needed this past winter. According to the old timers, high water like this used to be the norm and if we continue to have years like this, the entire ecosystem will greatly benefit. We may have to change our game plan a bit to get into fish over the next few weeks if the weather warms up quickly, but we will get into fish. And if it stays cool and the snow comes out slowly, fishing will be phenomenal. Fishing: excellent on blue winged olives in the afternoon. Nymphs in the AM, streamers in the cloudy weather. Weather report: Mostly sunny and in the high 40's to low 50's throughout the week.